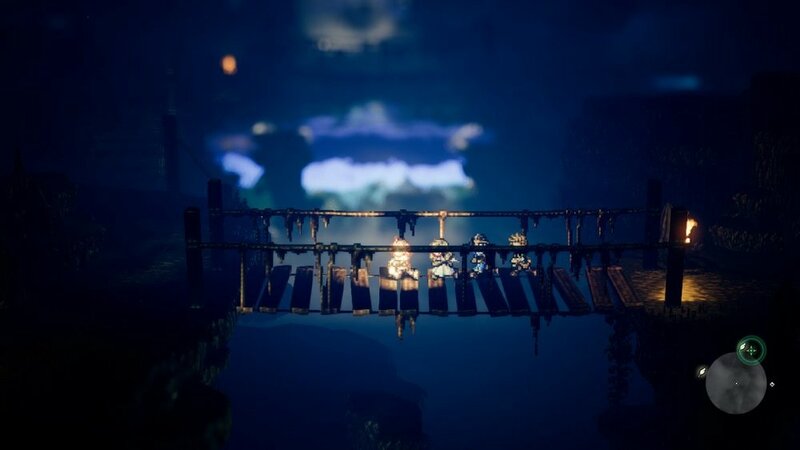 Octopath Traveler isn't about saving the world or anything that drastic in scale, no, it is rather a collection of smaller personal stories that, for the most part, never intersect. There are brief moments of conversation between each of the eight central characters, but these stories by large are self-contained to the character they belong to. This is even more apparent when tragic events befall one of those characters and your companions are mysteriously absent. It is these moments that can break apart the group dynamic and, to be honest, can cause the stories themselves to feel isolated and small. Each character will progress through four chapters that come with a recommended level set to them to indicate their difficulty. However, I strongly suggest being leveled much higher than the recommended level indicates as some of the encounters can bring some serious difficulty with them. With a host of eight individual characters to level up, missions to complete, and side quests to take on, getting to that next mission 'recommended' level can be done with only a small amount of straight grinding. 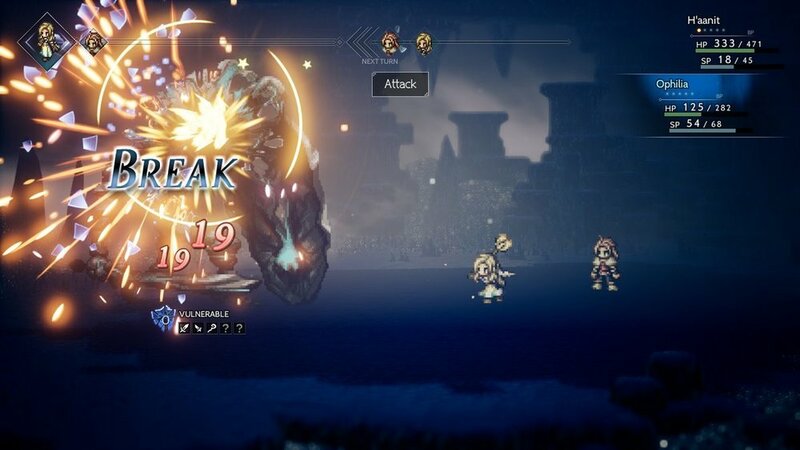 As Octopath Traveler doesn't contain a difficulty option, you can solve the easy and hard aspects of the challenge by either min-maxing your stats through various weapons and items, making the perfect combo of job and sub-job, or by simply grinding away until you are at a much higher level than the challenge recommends. The challenge is certainly there for those that crave it, but for those who simply want to enjoy the story, it just requires that you put far more time into the combat and stat-centric systems. For as deep and complex as some combat systems in JRPG's can get, Octopath Traveler is refreshingly simple, yet loaded with depth. The main focus of each encounter is to break your opponents' guard with the four available party members at your command. You'll do this by striking them with an attack they are weak to. While some have as few as one weakness, several contain significantly more. Each opponent will be protected by a certain guard level that must be chipped away in order to break them and several bosses will actually rotate their weaknesses between turns or even bring out reinforcements that will prevent you from accessing those weak points. In fact, most of the boss encounters can last 30 minutes or more due to how the fights themselves play out. Ending the turn with a bosses guard level at one due to a missed strike can be a frustrating experience for sure, but pulling off a lucky strike or a string of solid attacks that lead to its demise can be an absolutely thrilling event. When I was locked in battle with Ophilia's final boss, his health was drastically low and I knew the battle was almost over. Ophilia had been struck down on the previous turn, and I decided that one big play was about all I had left as only Olberic and Alfyn stood in his way before the boss would have another two attacks that would easily end my third attempt. Olberic's BP was fully charged and his Abide skill used the turn prior, ensured that my next few attacks would hit a whole lot harder. I selected his special attack, Brand's Thunder, and unleashed it upon thy foe. It missed. I almost dropped my Switch and I let out a big sigh. Now, this could have been assisted with H'aanit's Take Aim skill, a move that greatly increases each companion's accuracy, but H'aanit had been out of SP and using that skill just wasn't an option that turn. Thankfully, Alfyn had 3 BP saved up and charging his Last Stand skill managed to finish off the boss anyway. The last few rounds of that fight had been a rollercoaster of emotions. The core aspects to combat are based around the three attributes attached to each character; BP, HP, and SP. Boost Points, which are gifted to you at the start of each turn, and each subsequent turn provided you don't spend it, can be spent to enhance any particular skill or allow for a repeated strike of your basic weapons. While you can save up to a maximum of five BP at a time, you will only need three to maximize any particular skill. While you'll want to use some BP to get in a few extra hits to lower an opponent's guard, it can be a difference maker when you have enough to enhance a very powerful attack to its maximum effect, that is, if it actually hits. HP is a given as this is your health, and while there is an overall cap given to your current level, there are skills and items that can allow you to extend it past the maximum amount. SP is your skill points and these are spent on triggering various skills and spells that you can pull off. The dynamic of Octopath's combat is the combination of BP and skill attacks that can result in much greater damage numbers given the flow of combat and the state of an enemies guard. Apart from strong physical attacks or raining down fire from above, there is also a strong emphasis on status effects and perks that can make or break most encounters. You have typical things like poisoning your foe, casting confusion, sleep, silence, or downgrading their defenses, but you can also boost your own attacks or increase your critical rating or accuracy. These skills take the place of a typical attack, so knowing when is the best time to play the long game is another skill unto itself. During each of the major boss encounters, I always tried to keep them poisoned during each turn, casting Empoison any chance I could get. By boosting the attack, you can allow the effect to last through upwards to nine turns. Should you bring in Primrose or Ophilia, and recruit a townsperson to assist you, you can find those who also inflict status effects to double down on the horrors you wish to unleash upon your foe. This method can also grant you a total of six party members as opposed to the typical max of four. A standard encounter goes as such; you'll start the round opposite a group of enemies which usually consists of anywhere from three to four. Each of them will have their weaknesses hidden from you until you either hit them with the appropriate attack, or use a scholar to reveal them one at a time, or more should you boost your Analyze skill. There is a turn order at the top of the screen that indicates who attacks when and in what order. Like in the Grandia series (Fyi, Grandia III is one of my favorite RPG's bar-none), for instance, you can adjust the order with certain skills or by breaking your foe. Shattering their guard forces them to withdraw from combat from the current turn as well as the following one, thus allowing you to unleash as much hell as you can during the next few attacks. At any point during the match, you can use specialized skills that each job class has available to them. These are elements of their class that are exclusive to that character and are not shared with equipping that class as a sub-job. The hunter can capture various animals and creatures and unleash them during combat, the merchant can collect money just as the thief can easily steal an item during their turn. Once the enemies are defeated you will earn money, experience and job points that you'll use to purchase new skills for each of the jobs or sub-jobs you have unlocked. The job classes available from the start of the game are; Thief, Cleric, Warrior, Dancer, Scholar, Apothecary, Merchant, and Hunter. As you can choose your starting character, it will dictate how the first few hours of the game will go. As you will experience each story in full, you need not worry about missing any content by choosing one character over the other. The only catch to choosing your starting character is that they can never leave the party. You can also choose to head out in any direction and recruit your team in any order you like. As you travel around the vast world offered in Octopath Traveler, you will discover shrines that are placed to honor these job classes. By discovering these shrines, you unlock the ability to equip one of these jobs as a sub-job to any member of your party. Some characters will benefit from mixing and matching different types, but stat wise, certain jobs will benefit a character more. As I am not really a stat-focused gamer, I choose scholar as a sub-job for H'aanit, Apothecary for Ophilia, Thief for Olberic, and Hunter for Alfyn. This was my main team for a while, with subbing in Tressa, Therion, Cyrus, and Primrose for each of their missions. One of the more engaging aspects of Octopath Traveler is talking with people who have played the game and discovering what combinations they went for and why. I'm very positive that many of you are shaking your head at my choices and that's fine, I know full well that I may not have made the best combinations but they did serve me well in the overall scheme of things. When you have sunk enough time into the game and reached at least level 50, you can take in the more difficult dungeons that are actually additional shrines for even more job classes. These new sub-jobs pack a considerable punch and the challenge to unlock them is high. I do recommend starting with the Runelord job class and equipping it to Tressa and then making a play for the others. Just make sure to unlock the ability to share her Sidestep ability. You'll thank me later. My biggest gripe with the sub-jobs is that while they change the overall look of your character, these new looks do not translate to the character model that is used to travel around the world. You'll see these new costumes during combat and in the menu's, but nowhere else. While it may sound like a very minor issue to have, I still couldn't help but feel a bit disappointed given how cool the outfits looked on each of the characters. Each of the cast has a wildly different narrative as well as a very different voice, not just in the actor or actress, but in the manner by which they speak. H'aanit, for example, with "oftenth talken like this'n" and while it can be somewhat easy to figure out exactly what she is saying, there are many players around the world that struggle with understanding regular ol' English let alone a tweaked version that often doesn't make sense. I mentioned this near the start of the review, but these stories themselves can lack cohesion and can often feel as if the character of that story is traveling alone, despite being part of a team. Sure, you'll get the odd conversation moment between characters, but these moments never happen during story dialogue cutscenes for that character, but rather after them. There is a moment where one character is drugged and robbed of a special item, yet we are made to believe they are alone during this act, yet we clearly know that isn't the case. Some character's stories are built around thievery or acts of revenge that can often be at odds with the morals of several of your companions yet it is never addressed and since your companions never intersect in another's story, it often goes unmentioned. As you explore each of the many towns spread across the map, you can interact with NPC's to gain insight on your current story, take on side quests, or due to special abilities granted to specific jobs; buy items, steal items, or just flat out beat people up. Characters like Olberic and H'aanit can challenge any talkative NPC to a fight, regardless of them being a child or an elder of the town. These moments are silly and are often met with equally silly dialogue after the battle. Therion and Tressa can gain access to items that can easily help you in your battles, so it is a very strong recommendation to have these characters in your party when you visit each town. 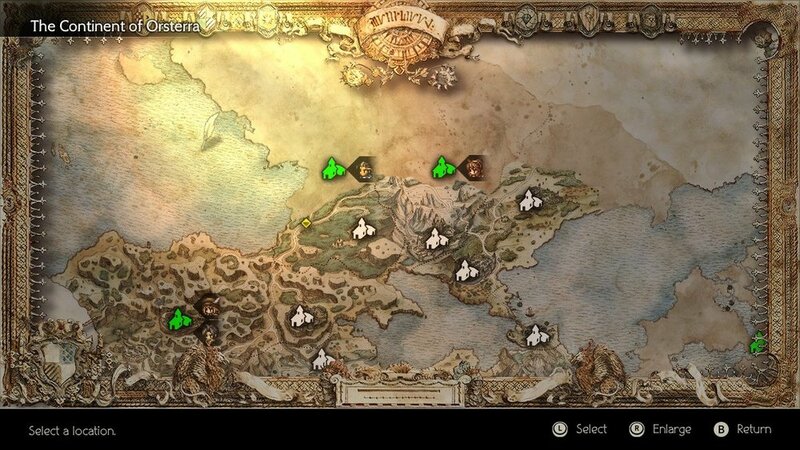 My only gripe with the town system is that during the stories for each of the characters, the area can feel instanced and feel far too linear in its approach. Octopath Traveler is a gorgeous game and one of the most visually striking ones around. This isn't a photo-realistic adventure with state of the art visuals or high definition textures or detailed character models, no, this is an artistically stunning game that has phenomenal art design and style. Characters are displayed through charming 2D pixel art with the 3D world around them set up like a wildly ambitious diorama setpiece. In fact, the moments that take place in buildings mimic that setup exactly. The pictures I've included here only paint half the story as this is a game you need to see in motion to truly appreciate just how great this title looks. The sprites given to each of the varied cast of not only the main characters but their enemies as well are wonderfully crafted, as are the larger than life bosses that are even more impressive. I'm also going to discuss one more thing that frankly, I might be the only reviewer to even mention this as I've yet to see this talked about anywhere; play this game on a 3D TV. If you have one of these tv's, turn on the 3D mode and prepare to see this game in a whole new light. The 3D enhances the diorama look even more by adding a depth of field that makes the environments and characters pop off the screen. As much as I wanted to sink time into this game via the portable nature of the Nintendo Switch, which still looks incredible I might add, I couldn't wait to get home and play as much as I could via this 3D option. Now, the game doesn't actively support 3D, but 3D TV's allow you to convert anything you watch to a faux-3D format. I've tried this with numerous games before and the effect is hit and miss. Regardless of 3D or not, Octopath Traveler is stunning as both a handheld experience or a big screen adventure. The voice work featured in Octopath Traveler is fantastic and I was surprised by just how much there was. Many of the core narrative moments in the game feature some lengthy and strong voice work. You can choose the standard English voices or the Japenese ones, should that be your fancy. If the dialogue isn't voiced, characters will spout off a quick word or two that illustrates the point they are trying to get across. If a character is saying something like "I'm afraid I cannot help you." the quick delivery of audio will feature a spoken "I'm sorry." or a "No." While these bits of dialogue rarely get old, it is the battle chatter during combat that can become a bit tiresome when they shout off the same attack lines again and again. The musical score, composed by Yasunori Nishiki, is stunning and one of the best RPG soundtracks of all time. The pace and flow of the music blends into not just the combat, but the emotional weight that each scene is attempting to deliver on. I was pleasantly surprised that the battle music kept changing during each chapter and not a single piece of music in this game felt repetitive in any way. Octopath Traveler was a game I expected to enjoy, but one that I wasn't expecting to love. There are some story elements that fail to impress as not every narrative featured here is solid and the lack of the interactions between party members can often be at odds with itself. Where Octopath Traveler excels is in its combat system that is highly addictive and allows for an unprecedented amount of experimentation. There is almost an infinite amount of combinations between not just who you put in your party, but the sub-jobs you equip to each of your companions and the skills you choose to rely on. I've never been one to enjoy turn-based RPG's let alone those with random battles, but somehow Octopath Traveler made me not only embrace these mechanics but relish in each and every encounter that came my way. Octopath Traveler is another title for the Nintendo Switch that is a must-have addition to its library, and a game that is easily a contender for several 'Game of Year' discussions. Octopath Traveler was purchased by the reviewer.